The Brock Street Public School was built in 1916 on the east side of Brock Street south of Victoria Street. Also known as the Bay School, it served Port Whitby until it closed in 1969. The building was demolished in 1998. At the time of the photograph the building was being used as a maintenance building. 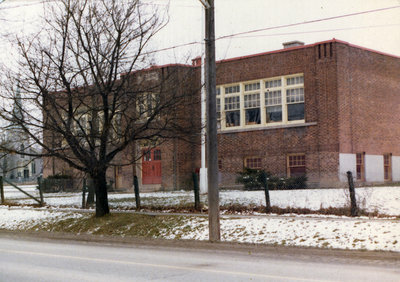 Brock Street Public School, 1977, Robert Kirk. Whitby Archives D2013_005_001.